Normally you see a void at the center of a Campagnolo crankset spindle. But on Cunego’s race bike — and his spare bike on the roof of the team car, as well as Michele Scarponi’s bikes — that void was plugged with what may be the next generation of the Ergomo powermeter. In the history of power measurement, Ergomo is a four-letter word. 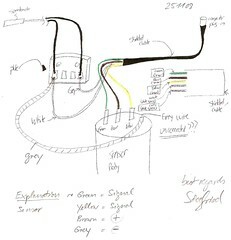 As a bottom bracket-based system, it was unique. For a decade it promised amazing technology, and for a decade it disappointed. It suffered from a Book of Job-like plague of bugs, and was handicapped by a klugey computer head the size of a solar calculator. Its last push into the US market was led by Gita Sporting Goods, one of the most reputable wholesale distributors in the business. What transpired was an electronics disaster arguably second only in bike industry lore to Mavic Zap. Ergomo disappeared from the US market in late 2007. 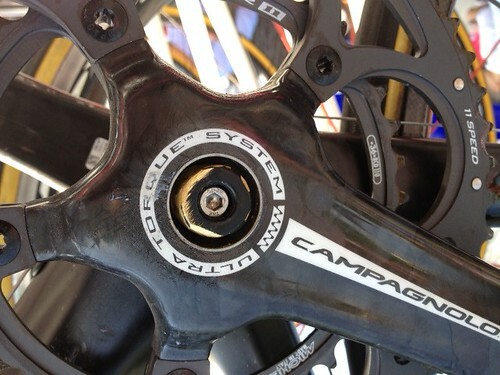 So, if that is an Ergomo inside Cunego’s crankset, what has changed? Based on Cunego’s use of an SRM Powercontrol 7 computer, it would appear that the Ergomo uses the ANT+ wireless protocol. Inquiring minds want to know. A couple of other details stand out in that photo. First is Cunego’s gearing choice, a 52×36. Because this has surfaced before at the Giro, we refer to that uncommon chainring combination as a ‘Dolomiti Compact.’ It’s the ideal set-up for the pros when tackling savage climbs like the Mortirolo and the Stelvio. For the rest of us, it’s an ideal combo given how little time most of us spend in 53×11-13, and how a 50×34 feels too much like hitting from the ladies’ tees. From an industry standpoint nothing would be better than a universal embrace of 52×36. It’s an inventory pain to stock deep size runs of both 53×39 and 50×34 cranksets. And it’s pure economic hell for bike shops to stock two deep size runs of bikes identical except that one has standard cranks and the other has compact. Also, do you notice that Cunego is running a Miche inner ring? 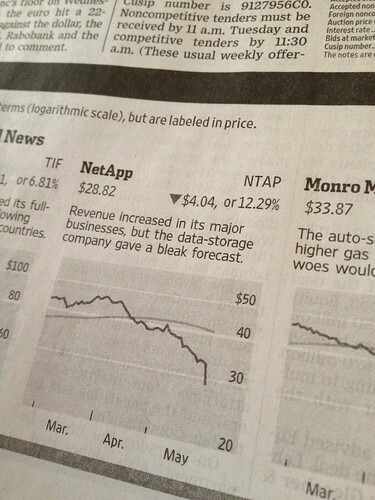 – Speaking of economic hell, the NetApp cycling sponsorship doesn’t appear to be doing favors for its share price? – Lately, I’ve been piling some miles on a Pinarello Dogma 2. Even with the second-generation SRAM Red, it’s decidedly heavier than my Wilier Zero.7 with Di2. 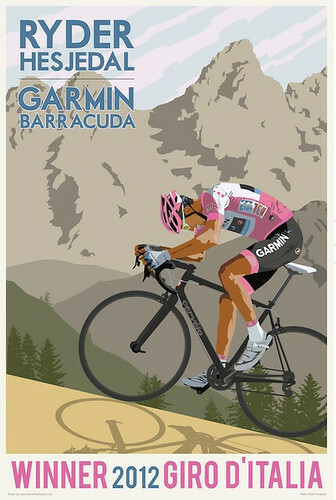 Nevertheless, it’s an incredible bike to ride hard, unexpectedly so on long climbs. 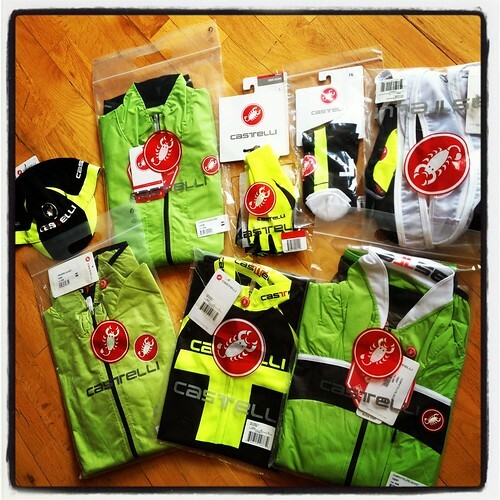 Pinarello has long extended a big middle finger to weight weenies. Its ethos is that shaving grams is eventually detrimental to a bike’s rideability. By having a bit of extra mass to work with, it’s as though Pinarello builds frames with improved stiffness and responsiveness. 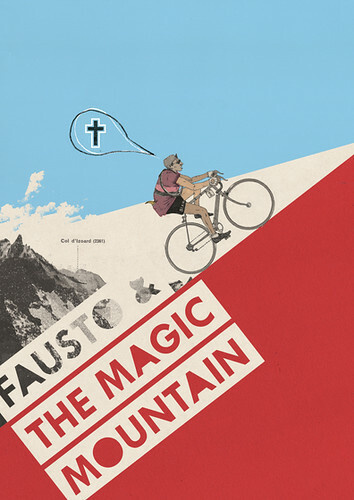 Climbing on a Dogma 2 gives you an all-new familiarity with the phrase power transfer. And the magic mix of its geometry plus frame stoutness makes descending feel like you’re operating a slot car. The slight bit of extra weight is a trade off I’m glad to make. 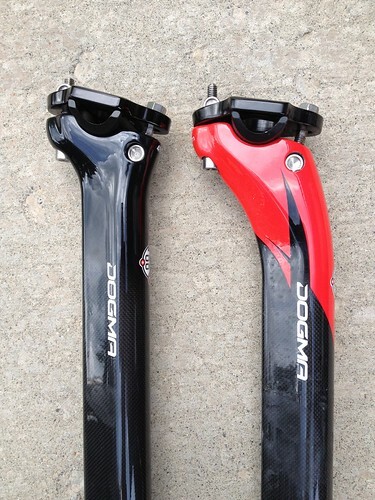 My only reservation about the Dogma 2, in fact, is its seatpost. The problem is in two details. First, to cinch the saddle rails you need to use a 5mm allen for a rear bolt and a 10mm open-ended wrench for a front bolt. The need for a 10mm bolt head makes dialing in your seat position an awkward and time-consuming effort. Secondly, the stock seat post has a substantial amount of setback. That forces many folks, including me, to jam the saddle to the very front of the post. This is a huge aesthetic bummer. While poking around online, however, I discovered that Team Sky’s Edvald Boasson Hagen equips his Dogma with a zero setback seatpost. From not knowing such a thing existed, I’m now the proud owner of one. At ~$400, the retail price is a doozy. But bike fit is everything (except, maybe, for bike vanity), so my Dogma 2 is now new and improved. We’ll have those posts for sale on the site ASAP. – The opposite of a huge aesthetic bummer is a huge aesthetic win.